First up, make your dumpling filling. Place your dried mushrooms in a bowl, covered in warm water and soak until rehydrated. At this point, drain the bowl and finely dice the now soaked mushrooms, as well as finely dicing the bamboo shoots and chinese leaf. Then, in a large mixing bowl, combine the diced mushrooms, bamboo shoots, and chinese leaf along with the pork mince, prawns, crab meat and all of the seasonings. Mix thoroughly to ensure an even distribution of each ingredient, then cover the bowl with cling film and leave to chill for approximately 1 hour. Meanwhile, jellify your chicken stock. In a large saucepan, bring your chicken stock to the boil and add agar agar - approximately 1.5 times as much as is recommended on the pack. Stir the agar agar powder through until dissolved and then remove the pan from the heat, pouring the stock into the base of a large shallow dish, then leave out at room temperature to set. Next, move on to your pastry! Mix all of the dry ingredients for ‘The Pastry’ into a large mixing bowl, then gradually add in the boiling water while stirring, until you form a dough of playdough-like consistency. Add a teaspoon of vegetable oil to the bowl and roll the dough through it, picking up the excess the flour from the sides of the bowl, before then removing the dough from the bowl onto a flat surface dusted with more tapioca flour. Now, knead the dough until it forms a smooth, elastic ball. Hold the dough steady with your non-dominant hand, then press the palm of your dominant hand into the dough and away from you. Fold the stretched dough back over itself and press down and away again with the palm of your hand. Repeat until the dough loses its grainy texture, stretching smoothly under your hands (Hint: High gluten flour has more elasticity than plain flour do will require a greater force of keading - and probably a greater length of time!). Dab oil over your smooth ball of dough, before covering it with a wet cloth or cling film and leave to rest for five minutes. By now, your agar should be set. If so, use a knife to cut the jelly into small cubes. Remove your bowl of filling from the fridge and add to it your cubes of chicken stock, mixing thoroughly so jelly is evenly distributed throughout. Return the bowl of mixture to the fridge to chill for the rest of the hour required. After five minutes, when your dough is ready, it’s time to get folding! (Hint: it is much easier to follow a visual demonstration of pastry folding than it is to read about it, so please check out our YouTube video here). Firstly, roll a third of the rested dough, into a long cylinder, roughly 2.5cm thick, keeping the remainder of the dough covered so it doesn’t dry out. Cut the cylinder into 2.5cm chunks, then roll each piece of dough into a small ball and set aside. While you are turning the pastry, using your right or dominant hand along with a small rolling pin, with a relevant amount of force roll inwards towards the centre of the forming circle, allowing your pressure to ease up when rolling outwards towards the edges of the circle. Turn the pastry clockwise with your non-dominant hand and continue this rolling process, eventually forming a small round circle with a slightly thicker hump of dough in the middle of the pastry. This thickness will help to protect the filling from breaking through the thin pastry, keeping your dumpling perfectly intact. Remove your dumpling filling from the fridge, and place 1 teaspoon or so of filling into the centre of the dough - ensuring you get some of the chicken stock cubes. Now, hold the dough lightly in the fingertips of your non-dominant hand, holding your finger tips together to form a small cup or bowl. Holding your thumb on the outside and towards the base of the pastry, carefully create pencil pleat after pencil pleat of pastry, one on top of each other, much like how a curtain folds when drawn along a rail, taking care not to rip the pastry, turning the bao slowly with your non-dominant hand so the pleats wrap around the entire dumpling. Keep folding over each other, until you get halfway around the pastry with your pleats, keeping your left thumb lightly over the top of the filling to keep the filling in the centre of your pastry and stop it falling out. Once you have reached half way, tilt your non-dominant hand - the one that is holding the pastry - slightly upwards, as if giving yourself a ‘thumbs up’ whilst staring at the inside of your fingertips. Now continue with the pencil pleats, using your dominant thumb and index finger, by twisting into the pastry and continuing to pinch the outside together to form the pleats. Continue with the pleat until you get to the end of your pastry, then twist into the top of the pastry once or twice and pinch the centre of the dough together to seal the bao and make “the money bag” shape. If you get this far, then give yourself a pat on the back and repeat until you have used all the dough. Once you have made your traditional bao shapes, cover with a damp cloth and set aside to rest for a further 15-20 minutes. Finally, it’s time to steam! Fill a wok halfway full with water, and bring to a boil. 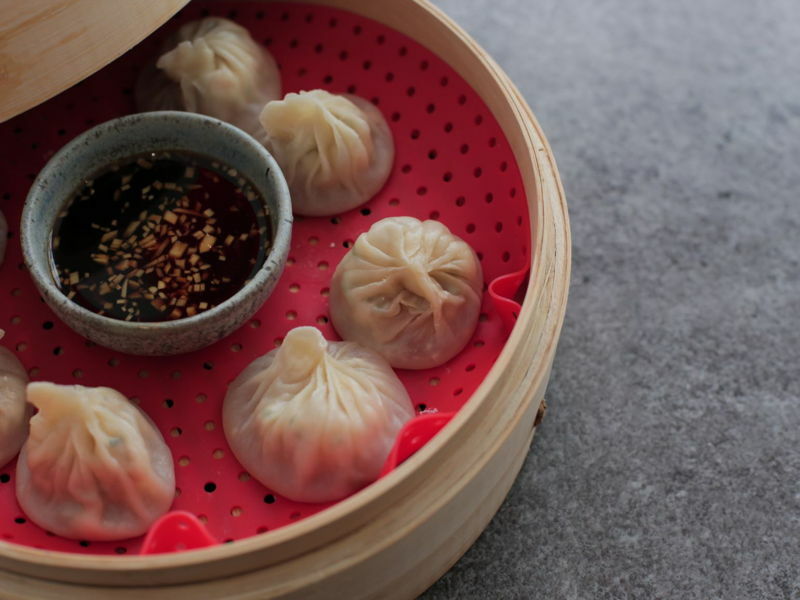 Place your prepared dumplings into a lined steam basket, close the lid, and place the steamer on top of the boiling water. Leave the dumplings to steam for approximately 12 minutes, or only 6-8 if using a fish-only filling, resisting the temptation to open the lid of the steamer during cooking. Once cooked, remove the steamer from the wok and leave, lid on, to sit for 2 minutes on the side. Serve, and enjoy alongside a dipping sauce of your choice.